Today, the seven year anniversary of heaven gaining an angel, I embark on a new adventure. Mary Jane always instilled life long learning in all of the children she came in contact with, even her own. 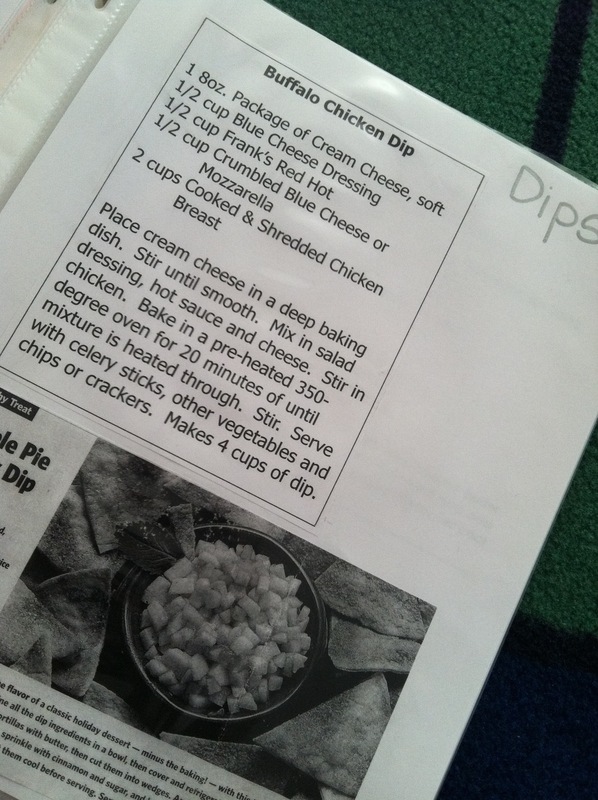 Over 2 years ago, C and I tried to reproduce one of his family’s old recipes. Needless to say, I ruined it. I was crushed. 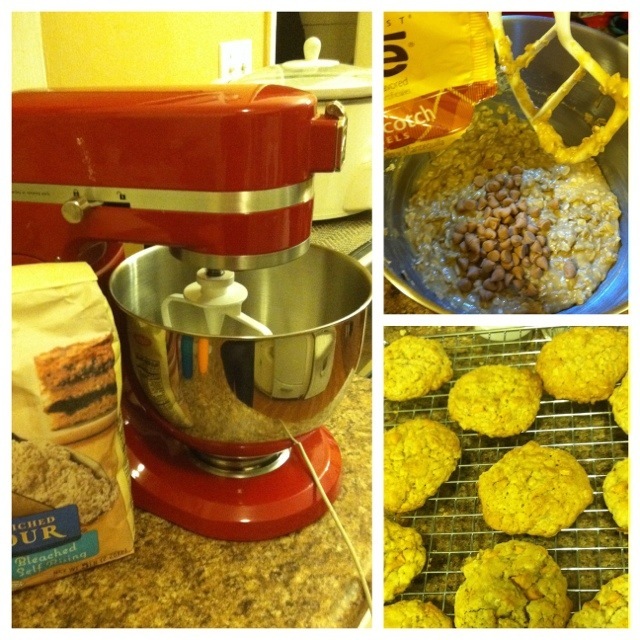 Other than a few box or pre-made mixes, I have NOT baked since then. I was mortified to dust my apron off and try again. Until last week, that is. I was watching an ep of Dr. Oz with Rachel Ray. She shared a similar story, but she didn’t bake again for near 30 years. After her hiatus, she started off slow and got back into it. If the 30 minute meal guru can do it, why can’t I? For Christmas, C got me a stand mixer. He knew I wanted to conquer this fear. Best gift ever. I love that guy. A great material gift, but it MEANS so much more. So, in honor of the best mom in the world, I break the seal on that enormous box and conquer that intimidation. I chose an oatmeal butterscotch cookie. They came out ok, with room for improvement. I am not feeling down, that I did not knock it out of the park. I will try again and keep practicing. Over the years, I’ve accumulated a handful of recipes. Either pulled out of magazines, cut out of newspapers, shared by friends or photocopied from cookbooks! I can never seem to keep them altogether. Nor can I find them when I’m looking for them. Emulated after a seasoned fellow cook, that I look up to! I bought a simple 3-ring binder, with the clear view pocket cover. Created my own cover and filled the binder with sheet protectors. 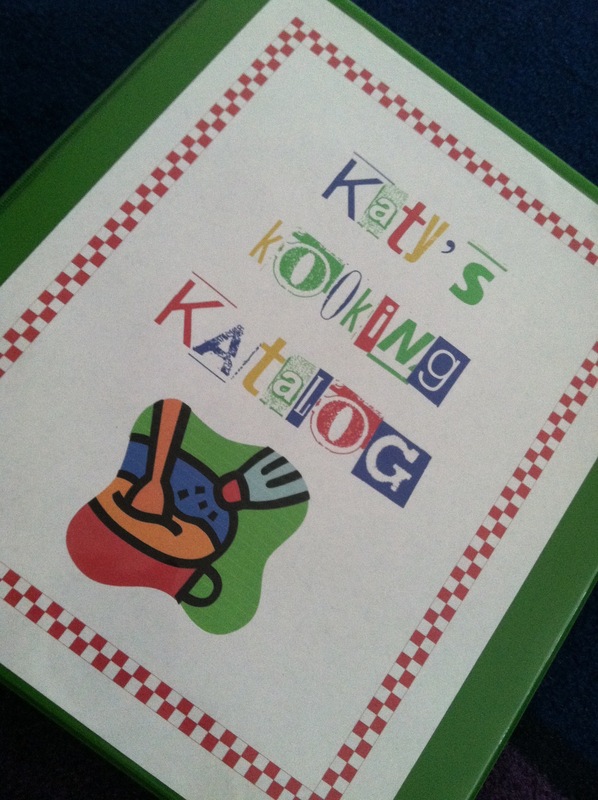 Next, I cut out my recipes and organized them into categories. Finally, I glued them to paper and put them in their respective order in the binder!! Sara suggested that I scan them into the computer and save them that way. Great idea, but I like the idea of taking the protected recipe out and bringing it to the kitchen, rather than running back and forth to the desktop for the next step. Hopefully I can keep it up and NOT lose the entire binder! TRAGEDY!! As you may know, I love to cook. Being stuck with a small apartment, an even smaller kitchen and a bistro table that seats 2…needless to say, I cannot host Thanksgiving dinner. I long for the day. Even though I am a great cook, I always get assigned the easiest things. This year it’s garden salad. So, I got my fixins but was left a little less than satisfied. A co-worker brought her Food Network magazine to work today. I perused it’s pages and dog-eared several recipes. One that I made as an appetizer for tomorrow. I will call them Easy Cheesy Corn Puffs and here is the recipe. it is really quite easy and super yummerific! I can’t stop eating them. I hope some make it to my sister’s tomorrow. What’s your specialty or tradition that you’d like to share? 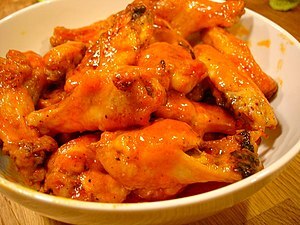 …that making Buffalo “Wangs” was so easy? In all my Food Network experience, I’ve seen wing recipes that require a multitude of steps. Until, that is, C and I saw an episode of “Best Thing I Ever…Made!” Low and behold it was one of my favorite chefs, Sunny Anderson. She made these “wangs” for Chef Emeril Lagasse. We fired up the deep fryer and got busy. I must say, we make a great team in the tiny lil’ kitchen. Not at all as sickly sweet as the Neely’s, good gawd I cannot stand all their PDA and small talk!! Anyhow, C did a fab job of separating the drums from the wings and removing the tips. I am not a fan of that job!! After that, I followed the recipe, only to add a bit more lemon juice for tang!! Needless to say, the pad still smells of fry grease and buffalo sauce. A fat kid’s heaven? Hmmmmm, perhaps. Good thing that was all I ate today!! Still under my allotted calories for the day! HA!! Looking for a fresh idea for plain ole chicken breasts, I turn to trusty Facebook. 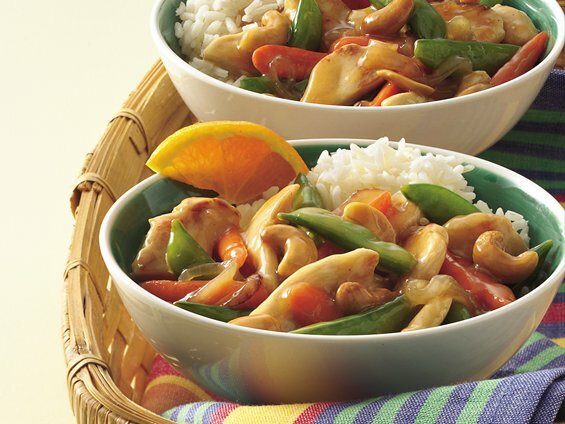 A former high school classmate suggested Cashew Chicken. I immediately get to Google’in! I love perusing online recipes and figuring out how I can tweek them to make them my own!! Assorted Veggies; Broccoli, Carrots, Onion, Snap Peas, Red/Yellow Bell Pepper, etc. 1. In a small bowl, combine the cornstarch, orange juice, soy sauce, ginger and honey. Mix until smooth. Set aside. In your wok, stir fry veggies with peanut oil. Cook until crisp/tender. Remove from wok, set aside and keep warm. In the remaining peanut oil, stir fry the chicken until theres NO MORE PINK. 2. Return veggies to the wok. Stir in the honey mixture, bring to a boil; cook and stir for 2 minutes or until the sauce thickens. Sprinkle with cashews and serve over rice!! !